MODULAR HOME BUILDER: Sales and Marketing - Chicken or Egg? 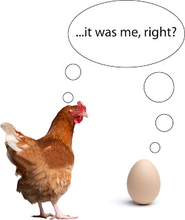 Sales and Marketing - Chicken or Egg? Similar to the old question which came first the Chicken or the Egg, the role of sales and marketing, their similarities and their differences have been debated for ages. Sales and marketing are relatives, or so to speak conjoined twins but are not one in the same. Great sales people seem to have a unique skill set that can only be taught to a degree. Whether it is nature or nurture it the ability to sell seems to be innate in the makeup of their personalities. On the other hand, the same can be said about marketing people. My question is why the line between of Sales and Marketing has been blurred all these years, especially in the modular housing business. Sales and Marketing seem to be two different disciplines, interdependent and linked but clearly maintain utilize two very separate skill sets and perspectives. A salesperson has to focus on the present like a laser beam. Sales must have a sales strategy, a target audience and should know their customers’ needs well. They are required to make weekly, monthly, quarterly and even yearly forecasts but a good sales person is always in the moment seeking to close that next sale. If sales are not focused on the here and now, ongoing revenue for the near term might not be realized. The sales person’s job is to open doors, hurtle barriers, overcome objections, negotiate pricing, oversee fulfillment and to service the client’s general sales needs. Marketing function is not to solely support sales but to also be prognosticators. Not only does marketing look at the present but also the future. As a marketer you know the marketplace and have the ability to look at your organization from the perspective of the customer. Through understanding the needs of the customer their job is to direct the company towards market segments, customer groups and channels where chance for success can be best found for profitability. Information gained by the marketer is used to create strategies, programs and tools to attract and convince customers. Their job is to build relationships (digital), and assist in moving and developing leads through the sales process. Sales and marketing are linked forever but do not share all the same DNA. The skills required to focus on the now are different than the skills needed for looking into the future. Sales looks through binoculars whereas marketing must take a 30,000 feet aerial view. Through the perspective of your customer, a marketer must look at look at your organization from the outside in. Sales must be focused on the here and now. The trick is bridging your sales strategy to marketing plans in pursuit of growth and opportunity. I welcome hearing from you about your thoughts regarding the differences and similarities between sales and marketing. Post your questions and ideas in the comments section below.